Here is your chance to own a complete set of twelve (12) 24KT Gold Plated and colorized Statehood Quarters U.S. 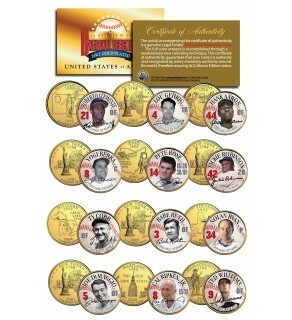 Coins featuring HALL OF FAMERS, in this Limited Edition GOLDEN BASEBALL LEGENDS Coin Series. 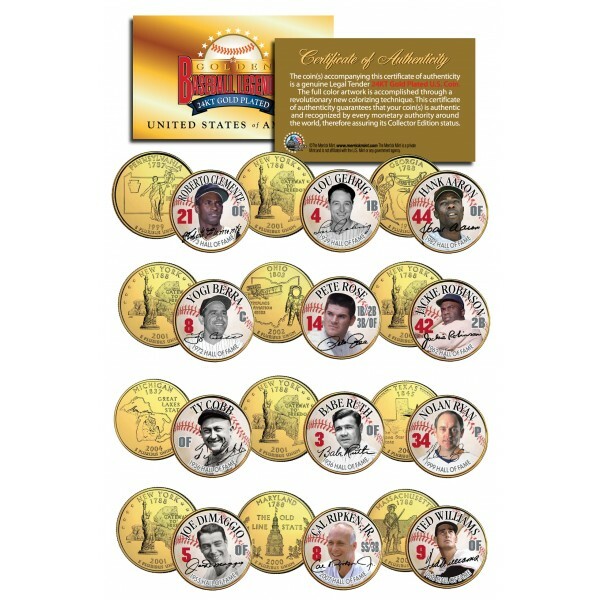 This 12-coin set features a rare baseball background design with each player’s statehood quarter matched to the state of his team. These high-quality, genuine Legal Tender United States coins have been layered in Genuine 24 Karat Gold, and then colorized using a unique painstaking multicolor authentic process by the Merrick Mint. Colorizing coins involves the unique application of special inks directly to the surface of a coin that achieves a level of detail, color saturation, and durability that is #1 in the coin industry. The result is an everlasting colorized coin collectible of ultra-high quality. Each 24KT Gold Plated coin features an emblematic design of the state on the reverse and colorized images of GOLDEN BASEBALL LEGENDS on the obverse (portrait of George Washington design). Each coin comes in a premium coin capsule. The 12-coin set comes with a Certificate of Authenticity to guaranty that your coins are authentic and recognized by every monetary authority around the world, assuring its Collector Edition status.